It’s time to grab some Pokéballs and prepare yourself for an adventure with Pokémon when it takes over Resorts World Genting this Christmas 2018 and Chinese New Year 2019. From 1 December 2018 to 28 February 2019, the Pokémon Festival @ Resorts World Genting will bring the colourful creatures from Nintendo’s best-selling videogame series 6,000 feet above sea level to frolic, play and captivate guests with their amazing powers and adorable nature. The Genting Pokémon Festival was launched today to the eager crowd by Susumu Fukunaga, the Chief Officer of The Pokémon Company as well as representatives of Resorts World Genting: Dato’ Edward Holloway, Executive Vice President of Leisure and Hospitality, Kevin Tann, Vice President of Promotions & Entertainment, Katherine Chew, Vice President of Resort Communications & Public Relations and Angela Hoe, Vice President of Retail and Tenancy. Visitors saw a very cute or as they say in Japan ‘kawaii’ dance by eight Pikachu which frolicked around the stage to the delight of the crowd. 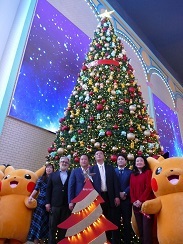 The guests of honour also had a lighting ceremony for the world’s tallest Pokémon Christmas tree which lit up the 40 foot tall spectacle that was adorned with the likes of Pikachu, Charmander, Snorlax and Eevee, among other. Continuing the long tradition of live Pokémon events worldwide – including the annual Pikachu Outbreak in Yokohama– the Pokémon Festival @ Resorts World Genting will be a collection of events big and small taking place under the roof of the resort for three months. 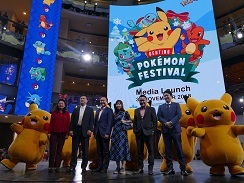 Loveable pocket monsters that have become pop culture icons like Pikachu, Eevee, Bulbasaur, Squirtle and Charmander will be displaying in the malls of Resorts World Genting, along with dozens of other Pokémon species to celebrate Christmas and usher in 2019 Chinese New Year. Things kick off with a wintry bang as the world’s tallest Pokémon tree is unveiled at the Skytropolis Funland. Decorated with hundreds of Pokémon decorations, this will also be the first ever Pokémon-themed Christmas tree ever in Malaysia – and the focal point for Pokémon fans young and old to gather and celebrate the magic of a Pokémon Christmas. Fans can also get up close and personal with the most famous Pokémon of all at Pikachu Land. A giant inflatable 6-metre-high Pikachu, surrounded by 50 smaller Pikachu plushies, will make the Skytropolis Funland its temporary home starting December 8, providing an irresistible opportunity to snap photographs with the lovable Pokémon with electricity powers – Pika! Pika! Live up to the Pokémon motto – gotta catch ‘em all! – and track down all 32 of the creatures. These special characters will be unveiled in 4 stages at Level 3, SkyAvenue (1st Dec 2018 onwards), Level 2, First World Plaza (15th Dec 2018 onwards) and Symphony Stage, Level 1, SkyAvenue (10th Jan 2018 onwards). 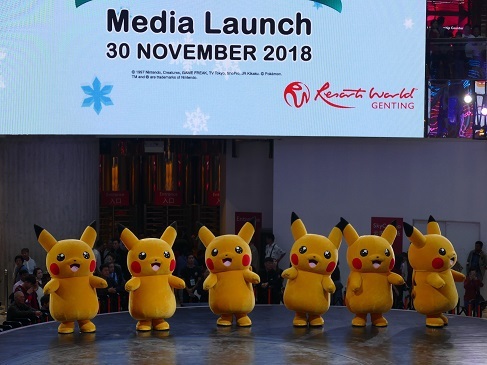 Over the duration of the Pokémon Festival @ Resorts World Genting, there will also be Pikachu Parade taking place at various times daily on Level 1 of SkyAvenue mall, featuring 8 life-sized dancing Pikachus. For Christmas, the parade will be a winter-themed extravaganza, with Santarina, Giant Xmas Balls, and elves on two mini-floats. For Chinese New Year, the parade switches to a raucous red-and-gold celebration. Featuring 8 adorable dancing Pikachu led by a vibrant host, the show at SkyAvenue’s Times Square stage will be a dream come true for all Pokémon fans. The parade will take place at selected times and dates. The aim of the Pokémon videogame is to become a master Pokémon trainer, and the Pokémon Festival @ Resorts World Genting allows you to live out this goal in real life. With the Pokémon Trainer programme, budding trainers can receive a trainer book from four specific Pokémon Trainer Stops set up across the mall. With this precious book in hand, the newly-empowered Pokémon Trainers can tackle various missions and quests spread across the resort, from snapping photos with rare Pokémon to solving challenging puzzles; once the training is complete, trainers can present their finished trainer book to receive a set of 8 limited edition Pokémon stickers from Resort World Genting’s special Pokémon Pop-Up store. Different missions will be available for Christmas and Chinese New Year, allowing Pokémon Trainers to catch ‘em all, twice! The Pokémon Pop-Up store is located at Level 3 of SkyAvenue Mall, the store will feature a huge array of premium merchandise and memorabilia imported directly from the Pokémon Centre in Tokyo, Japan. It’s the perfect place to pick up a present for Christmas or prepare for the festivities of Chinese New Year for lovers of Pokémon. At Vision City, make sure you collect all different Pokémon TRETTA chips & get limited free tretta chips from Pokémon Pop-Up Store on a first come, first served basis. 韩国男团 MASC 12份来马, 与粉丝倒数圣诞和过新年 !